UMNO Youth is cashing on the large numbers of 'Mat Rempits' in Malaysia as preparation for the upcoming elections. 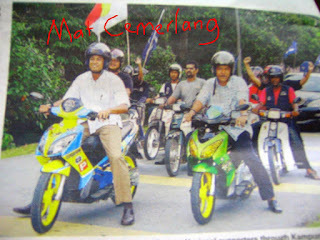 The new image of 'Mat Rempits' who turned 'Mat Cemerlang'. See if you can spot the leader of all Mat Cemerlang in this picture.